This little brother to Samsung’s Q8 and Q9 series uses side rather than direct backlighting, so it doesn’t have quite the same brightness, or pop to the HDR. 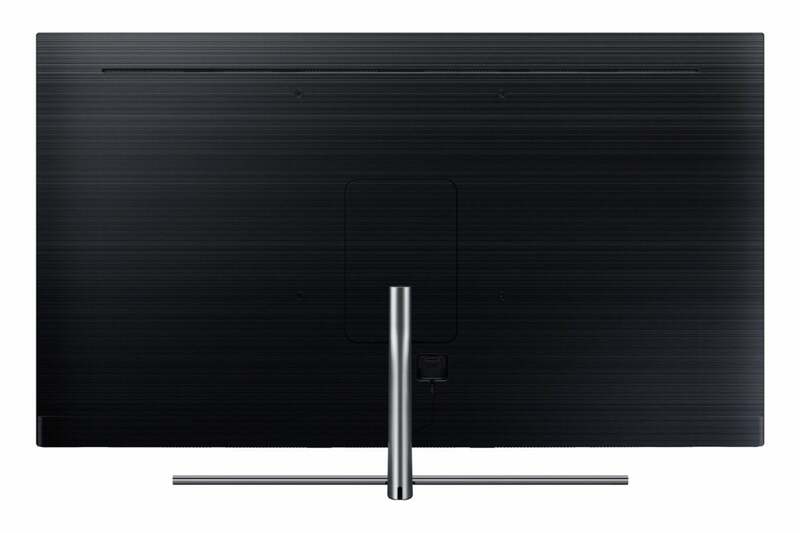 But it’s still one of the best TVs on the market and significantly less expensive. 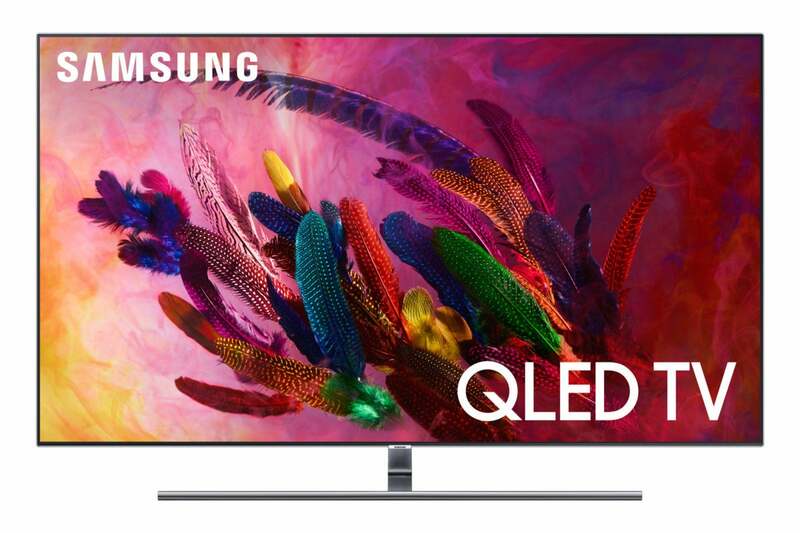 If you’re looking for a smart TV, but haven’t shopped Samsung’s QLEDs, you should—they’re arguably the best TVs being made today. 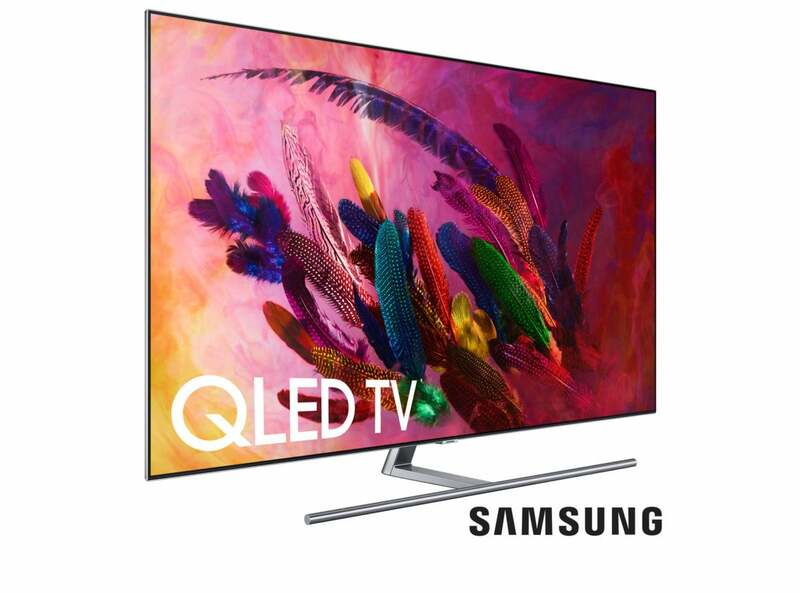 And while the high-end Q8 and Q9 series might induce sticker shock, the Q7 series are relatively affordable and deliver the same rich and accurate quantum dot color. Indeed, once you’ve seen them, the 55-inch 55Q7FN ($1,500) and the 65-inch 65Q7FN ($2,400) reviewed here won’t seem overpriced at all. The only major difference is that the Q7 series TVs utilize edge lighting rather than direct backlighting. But the the only time you might really notice the lesser brightness and contrast (if you’re being really picky) is with HDR (high dynamic range) material; otherwise, they deliver largely the same experience. Short of embedding your TV into the wall, you won’t find a cleaner installation than you get with the 2018 QLED TVs, including the 65Q7FN. It’s less than two inches thick (56.9 inches wide and 32.6 inches tall), weighs 50 pounds, and has barely any bezel at all—about 0.2 inches. Samsung calls it bezel-less, which is in line with the industry-wide practice of omitting qualifying adjectives such as “practically” or “almost” from nearly all statements. 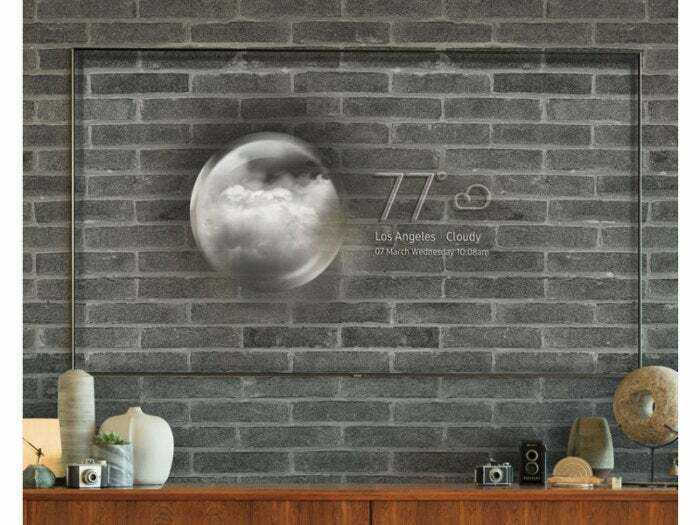 Samsung sells a flush mount that will get the TV “almost” flat against the wall. Nothing to see here, folks. The single very thin cable that connects the One Connect breakout connectivity box is routed through the stand. You’ll only see it if you wall mount the TV, and even then it’s hardly obtrusive. But there are two things that really heighten the “disappearing TV” design motif. The first is the single thin cable running to the TV that carries all the signals and—new for 2018—the power. It connects to a breakout box which houses all the ports: four HDMI, three USB, one coax for an antenna (there is an onboard tuner), one RS-232C, and ethernet. The Wi-Fi adapter onboard is 802.11ac, and there’s Bluetooth support as well. The upshot is, the One Connect box finally deserves its name. The second feature that aids with the minimal-visual-intrusion design aesthetic is Ambient Mode. Basically, you take a photo of the area surrounding the TV using your phone, perform a couple of tricks using the Samsung app, upload it to the TV, and you wind up with something like what you see below. Note that we don’t build with brick here in earthquake country anymore. The QLED series will mimic the area surrounding the TV based on a photo you take and process with Samsung’s app. This is Samsung’s picture, not ours. The black background in our test area didn’t do the Ambient feature justice. Ambient mode is a pretty cool feature, and I was surprised just how well it works. Personally, I’ll opt for saving power and live with the blank screen, but for parties it’s a nice conversation starter. Outside of LG’s magic remote and its free-range cursor, the QLED’s One Remote remote is my favorite among minimalist remotes. It’s small, feels good in the hand, looks classy, facilitates voice control, and—most of the time—is a joy to use. Especially clever are the the dual-function, “power window” style volume and channel-select buttons. Push forward to increase values, pull back to decrease them, and press down like a normal button to select. The One Remote is minimalist and generally a delight. But adding dedicated transport buttons wouldn’t hurt. The price for remote minimalism, on the other hand, is sometimes tedious scrolling through lists of numbers and functions. In particular—the transport functions other than Play/Pause (stop, fast forward, rewind, next, previous, etc.) require an extra press. I don’t think it would kill the concept or overpopulate the remote to add dedicated transport buttons, especially as the remote can control Samsung Ultra HD Blu-ray players. The QLED’s on-screen interface is attractively rendered and logically laid out; but again, it’s a bit tedious. The “home” button, for instance, takes you to the same place on the menu every time, no matter where you were when you last accessed it. If I was in Expert picture settings, and wanted to see the results of my calibration without the menu visible, to get back there I must click Home, scroll to the settings, then click my way through to the Expert settings again. It’s a pain. Perhaps a browser-style forward button to compliment the “exit” button. Just saying. Less is more, except when it’s not. As QLED TVs are closer to OLED in terms of performance and price than other LED-backlit LCD TVs, the first thing I check is dark area contrast, blooming, and edge leakage. I was quite impressed with the Q7FN’s general lack of these noxious phenomena. Part of reason is that the Q7’s are edge lit rather than direct backlit, so there’s simply not as much light to block off. I did notice some slight leakage in the upper left of the display, but that was about it. It’s still not the velvety black of OLED, but the annoyance factor has been reduced to practically nil. After my time with the Q9F model in 2017, I was expecting a bit more sustained brightness from the Q7FN, but it maxed out at about 800 nits rather than the 1,000 I saw with more expensive TV with direct backlighting. Samsung assured me that the Q7FN can render 2,000 nits for very brief instances during the display of HDR material. I believe them, but don’t have the equipment to objectively verify it, and my impression remains that the HDR effect is not as pronounced as with the direct-backlit models. Color, on the other hand, is every bit as rich and accurate. Thank you quantum dots. It’s perhaps not quite as vivid as with the Q8 and Q9 series, but it’s darn close. I noticed some very mild moire and shimmer on slow pan shots with highly detailed 4K UHD video. I twiddled the Digital Clean View, Auto Motion, and contrast enhancer until the cows came home and was never successful at fully eliminating the problem. I’m being picky about that, as the Q7FN exhibits far less of the shimmer and moire than most LED-backlit LCD TVs. Let’s just say it’s that the closer to perfection you get, the louder the flaws. I should note that there was none of this on the store demo. That’s why we check with our own evaluation material. I also noticed some compression-like artifacts watching the overpass shoot em’ up from Deadpool. Not a big thing, and lowering the motion settings helped a lot. One more nice improvement is the off-axis viewing, which is simply superb. The new less-reflective display covering and substrate made the Q7FN viewable at even extreme angles. And it remained that way when we turned on the test lab’s glaring overhead fluorescents. There are not a lot of TVs that can match that aspect of the Q7FN. You may have heard commercials touting soundbars because of thin-screen TV’s lousy sound. Well, I wouldn’t call the Q7FN’s sound lousy. It’s clear enough and fairly loud, but it’s not great either. The stylish path to improvement is a soundbar, and you can find plenty of those in TechHive’s Soundbar hub. But the best soundbar in the world can’t come close to producing the sonority of a good surround system, or studio monitors, or a number of other options. Just throwing that out there for your subconsciousness to absorb. The Q7FN played back (from a USB stick) all the most popular types of my wide variety of test image, audio, and video files. This isn’t something a lot of users indulge in, but it can be revealing of how a company sweats the little things. Audio formats supported include MP3, M4A, Ogg, FLAC, APE, Apple lossless, and most common 16- and 24-bit wav files. Image files that it will render are .png, .jpg, .bmp, as well as one 3D format. GIF is not supported. Video file support includes all the major MPEGs, AVI, h.264, and h.265, but for some reason it missed on a couple of older h.264 AVCHD files and Ogg Theora. I’ll give Samsung a B+ overall, and recommend an Ultra HD Blu-ray player such as Oppo’s UDP-205 if you want broader file support . Now for the major conundrum facing anyone who wants to buy a Samsung QLED: What are arguably the best TVs on the market don’t support the most popular dynamic HDR format, Dolby Vision. All the other major vendors do. Samsung doesn’t support Dolby Vision, opting instead for its own format with dynamic metadata—HDR10+. Plain HDR-10 is supported as well. The Q7FN does support the universal one-adjustment-at-the-beginning HDR10, as well as Samsung’s alternative to Dolby Vision—HDR10+, which, as does its rival, supports scene-by-scene adjustment palette and contrast adjustment. About the only HDR10+ content available, however, streams from Amazon. According to Samsung, more is in the offing, but it’s not here yet and I’ve seen no announcements. If for some reason it doesn’t catch on, you’re going to be missing out on some very nice-looking Dolby Vision renderings. If it weren’t for the lack of Dolby Vision, the Q7FN would have my whole-hearted recommendation as the least-expensive way to get into quantum dot color. The picture is only slightly less fantastic than its pricier siblings and it pretty much disappears into the room like a chameleon. Good stuff and well worth considering even if you’re on a budget.